I admit it. I like wine. Red, white, fruity or robust, a glass of wine can make a bad day seem just a little better. I'm not saying that anyone should drink away her sorrows. For me, a glass of wine can be a relaxing moment (or two) for myself. The biggest frustration that I face with my glass of wine is opening the bottle. From removing the foil to successfully releasing the cork, the fight to pour my libation can be frustrating. Luckily a company has come to solve my program, Trudeau. Trudeau offers numerous wine and bar related products that make enjoying a beverage a little more fun. From wine charms to cocktail chillers, these items will make your next evening at home or entertaining friends more festive. Since I enjoy wine, there are two Trudeau items that have become my must haves, the Stress Less Automatic Lever Corkscrew with Foil Cutter and the Aroma Aerating Wine Pourer. 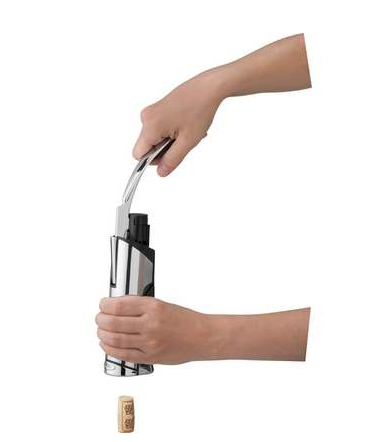 First, the Stress Less Automatic Lever Corkscrew with Foil Cutter is the simplest way to open a bottle of wine. I have struggled to open a bottle with a traditional corkscrew. The biggest problem is that I struggle to remove the cork. I'm not a weakling, but it doesn't take giant biceps to pull out a cork. With the Stress Less Automatic Lever Corkscrew with Foil Cutter, I have my wine opened with absolutely no effort. I know that I will never again struggle to open a bottle of wine. Now that my wine is open, I want my glass to taste amazing. Aerating wine is important for the wine to have the best possible taste. 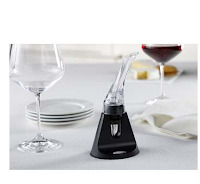 Wine that is allowed to breathe tastes better by enhancing the flavors and aromas.The problem that I have with most aerators is that I have to hold the aerator as I pour the wine. I don't want to mention how many times I have split wine because of my carelessness. The Aroma Aerating Wine Pourer fits onto the wine bottle for easy decanting. The one hand operation eliminates the potential spilling problem. 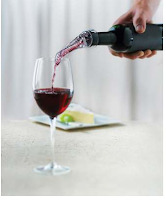 The Trudeau Aroma Aerating Pourer provides a double aeration process allowing wine to be aerated while it's inside the bottle, as well as during pouring. 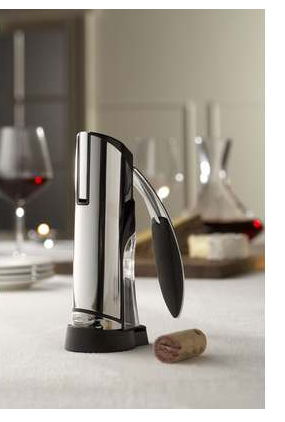 The Stress Less Automatic Lever Corkscrew with Foil Cutter and the Aroma Aerating Wine Pourer would make a great Mother's day gift. Pair these items with mom's favorite bottle of pinor noir and you have a gift that will make her smile. Red wine is my absolute fav and a great way to unwind! I need that last pourer product for the house! These are great accessories, I need the wine pourer. Looks like a great accessory. there's nothing more relaxing than having a glass of wine at the end of the day. I agree openion is the worst part. These products with very good and get you to your wife faster! I have the worst time opening wine! This looks awesome! Those look like great gifts for my MIL, thanks for the review!